I agreed to do a post-game short analysis for the Managing Editor of FishDuck.com, Paul Jones, but my reaction was the same as fellow analyst Rory Davidson and Hawaii Coach Tony Hoolulu. As we watched the game, we did not observe anything unusual about the Oregon offense or defense in the Rose Bowl– the Ducks just played the same tactics with superb results. Rory and I told you to look for a number of things in our pre-game checklist – but they did not appear for the most part. 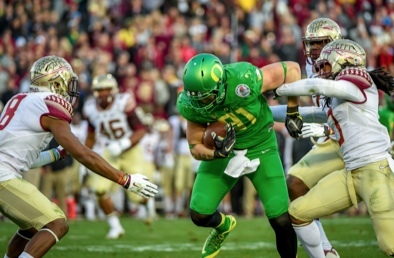 It was the most remarkable unremarkable victory by Oregon that I can remember. It was routine … and yet it was stunning. It was evident that Oregon wanted to attack the perimeter with bubble passes and sweeps, and they were successful as the game wore on. It seemed their intent was to open up the middle of the Seminole defense that Rory referred to in the above linked article. From there we saw Evan Baylis have a career game receiving through the heart of that defense and then the infamous New Inside Zone Read play for Oregon began to make its impact. So many times in the past we have observed Oregon pounding the middle with little success, and it seemed to be that way at first in Oregon’s attack on the edges in this National Championship Semifinal Rose Bowl. Truly, it opened up the pump-and-go and so much more for the Oregon offense that we will cover in our usual Tuesday analysis. 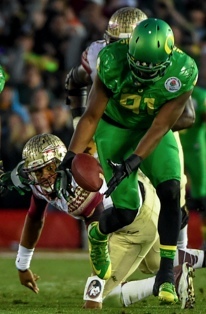 Were you surprised by the Oregon defense as I was at times? We shouldn’t have been, since this is how the Duck defense has played for the last six games of the season; they gave up yards but were stingy on the points. Oregon finished second in the Pac-12 for points given up (only to Stanford), but were WAY down the standings for yards given up … but who cares? As Pac-12 Analyst Rick Neuheisel once said, “Scoreboard baby!” This defense kept making huge plays by creating turnovers and errors by Florida State, and I could not be happier for Erick Dargan and Tony Washington as seniors who have given so much to the program in their career. 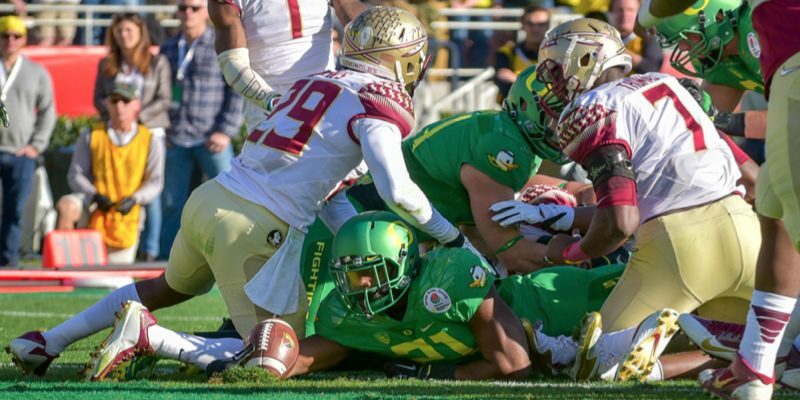 It was jaw-dropping to see the Oregon defense give up only two field goals in the first three times FSU entered the Red Zone. It came from their heart, and it came from some tremendous technique that the team of analysts at FishDuck.com are going to have fun examining closely after the season’s end. How happy were you for Thomas Tyner? His re-emergence could not have come at a better time as it seemed that Royce Freeman hit the freshman wall, and that some of his wiggle was burned out. Meanwhile the fresh legs of Tyner exploded and his reading of the holes in his Inside Zone Read touchdown was a textbook example for coaches teaching young RBs how to do it correctly. He appeared to be extremely close to popping some longer ones, and perhaps in the National Championship we’ll see his “spin-move” we enjoyed seeing against Stanford? At times over the years, I have been harshly critical of ESPN in their coverage and characterization of Oregon, but today it felt like an Oregon lovefest at times in their lavish praise and recognition of what the Ducks are doing and how, yes, we block and tackle as physical as anyone else. At this point I am doing a written equivalent of babbling, because I am still so stunned at what I saw. I invite your comments … especially from the fellow “Greybeards” who has been through as much Oregon football as I have. For now, please watch the short video (less than a minute) I made after the last Rose Bowl victory, since it feels precisely the same to me at this moment.